The Westside Orchard Garden is our main focus for 8 months of the year. Our annual harvest from this 2.2-acre former city park is dedicated to Meals on Wheels, the Head Start preschoolers, and the Boys & Girls club youth and their families. The first year (2013) we donated 500 lbs. of fresh produce to the Head Start Program; year 2 (2014) we increased our harvest to 4000# donated. 2015 was a tough year, and we didn't meet our goals, and both 2016 and 2017 yielded about 2000# of fresh produce donated to a variety of local organizations. .
We have youth from many organizations - the Boys & Girls Club in the Garden, the Salvation Army Youth Program, the Cameron Family Center (Rescue Mission) - in the Garden this summer for our Summer in the Garden Program. The first week of 2018 had 160 youth in the garden, which keeps our 2 AmeriCorps Summer Associates very busy. A Garden is a living, breathing entity, and ever-changing. This year we had an explosion of small critters (rabbits, gophers) in the Garden, very focused on chomping whatever was deciding to poke its green head out of the dirt. Our dedicated garden manager, Vicki, tried a variety of prevention ideas, and finally built the sides up on the raised beds so that the garden could grow without interference. Slowed down our harvest, but we did have well-fed furry creatures most of the summer. Because we are a designated wildlife habitat, we don't "eliminate" our furry friends, just try to keep them from eating everything we grow! The intense heat of 2017 was also tough on the garden - irrigation is great as long as the timers work, and the connections don't leak, and that's not always the case. Continued improving our drip irrigation system, reducing water needs once again ... (the 1st year we hand watered from a water truck, year 2 we had some drip irrigation and some hand-watering,same with year 3, and this year, we have worked hard to bring it to the apple orchard and the north orchard). Our own 5 beehives are doing well, buzzing and making honey, and which include 2 "flow-hives" - a new concept developed in Australia. Much easier on the bees when we harvest - be sure to come and watch this innovative way to harvest honey! You can order our honey "for a donation". 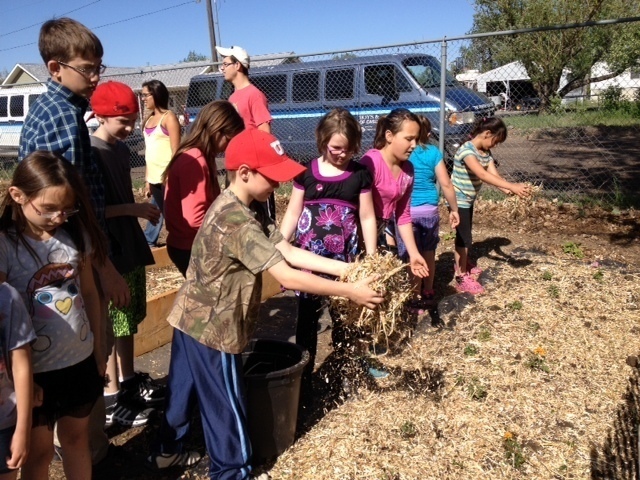 The Boys & Girls Club garden expanded with a strawberry box, and they were in the Garden Monday through Friday all summer, and some Wednesday afternoons after school began. What a blessing the youth energy is in the Garden. Expanded the Homeschool Garden this year. Fun to have a variety of families showing up to garden. Continued building our first hugelkulture on the south end of the Garden, and planted it with sunflowers that were donated. As it matures, we will add other plantings, especially for the bees, as it is close to the hives. We planted some grapes on the north side, and are anxious to see how they do this summer. Completed the installation of the Learning Center benches, and the Orchard Benches. All the Learning Center and Orchard Benches benches have been sponsored. Many thanks to the bench sponsors for helping us expand our youth program! Our Pole Barn is up and serving us well!. The local Carpenter's Union #82 volunteered their good works and built it for us. Thanks to Mario, Bret, Morgan, Kenny, Mark, Joe, Dan, Rande, and John. The roof is on, and thanks to a grant from the Town Pump Foundation, we have the doors on also. A few minor finishing touches in 2018 and it will be complete! Our perennial garden is beginning to take shape - donated flowers and bulbs make our apple orchard a place of beauty. If you have flowers to donate, be prepared to bring them out and plant them yourself, however, asour garden manager is busy with her own chores!. Added another lasagna composting plot for our potatoes and pumpkins and the crop is producing like crazy. We added a Garden Tower this last summer and it was fun to watch it produce and feed itself. Year two will be even better as we know which plants did well, and which didn't. We still have POTS for sale! We have 10 and 15 gallon growing pots for sale at the Garden - perfect for a patio garden. Pots are only $2 each, so come to the garden and load up your car.